David Agenjo (b. Madrid, 1977) is a painter who lives and works in London. In the context of contemporary figurative painting, he is best known for his compelling colour palette where personal colour arrangements and interpretations take his subjects beyond mere realism. Throughout his career he has evolved his practice from an intimate exploration of the human form, to a broader contextualisation of figures and, most recently, to still life paintings. Technical processes play an important role in his practice: painstakingly he builds his compositions through the application of multiple layers of paint, a labour-intensive practice that creates a foundation for his visual narratives. David’s latest paintings were first conceived when attending an artist-in-residence program in the complex frenetic city of Mumbai. He fixated attention on the city’s most marginal areas where local people and moreover piles of laundry and bags of rubbish became the first subjects from which he drew inspiration. The paintings were developed back in his London studio located in the heart of an industrial estate. Studies of adjacent domestic waste and commercial surplus acted as models for him and further complemented his body of work. His concern about sustainability and other social and ecological affairs give meaning to his depictions, reproducing endless manufacturing and consumerism, symptomatic of a globalized world. 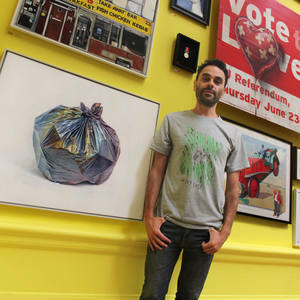 Born and raised in Madrid, he studied painting and printmaking at the Circulo de Bellas Artes in Madrid (2000-2006) combining his artistic practice with his profession as a graphic designer before moving to Dublin in 2007 as an independent artist. Three years later he moved to London, establishing his studio in an artist community, where he still lives and works. He has worked with galleries in major cities such as Dublin, London and New York and his paintings and private commissions have been auctioned and sold to collectors worldwide. He has been awarded artist residencies in Shenzhen, China (2013) and Mumbai, India (2014), as well as being selected by Artelista in 2014 as one of their top 8 contemporary artists to invest in. Most recently David’s work was displayed at the Royal Academy of Arts for the 250th Summer Exhibition (2018).